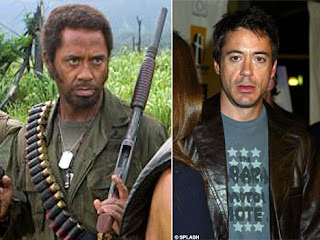 In Ben Stiller's upcoming movie titled "Tropic Thunder" Robert Downey Jr plays an African American. A dailymail.co.uk article says "Downey Jr plays a worthy Oscar-winning actor taking on a role originally written for a black actor, and rather than re-write the part, he goes method". Their caption for the image reads "Unrecognisable: Downey, pictured left and right's astonishing transformation was in aid of his role in a war satire directed by comic actor Ben Stiller. He said 'if you don't do it right, we're going to hell'". The article focuses on the fact that many are uncomfortable and angry with a white man portraying a black man. The photo reminded me a lot of one I saw back in college. My friend took a psychology class which addressed race and his textbook included pictures of celebrities with their race modified through photo-shopping. The one I remember best was of Arnold Schwarzenegger as a black man. The power of Google failed to turn up this image of him with photo-shopped dreadlocks.